I know I’m in the extreme minority but I don’t quite get the idea of celebrating birthdays (my own). I mean, I didn’t do anything to merit celebration. I was just born and I didn’t have anything to do with that. I’m not really a curmudgeon about it, but, you know, there it is. So, today is my birthday but the only reason you are reading about it is that I noticed my inbox filled with birthday greetings from businesses and it struck me that birthday marketing online would be a good topic about which to blog. 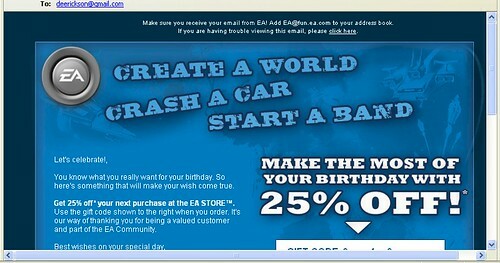 Electronic Arts wished me a happy birthday with 25% off at their online store. Great deal, considering how expensive video games are. 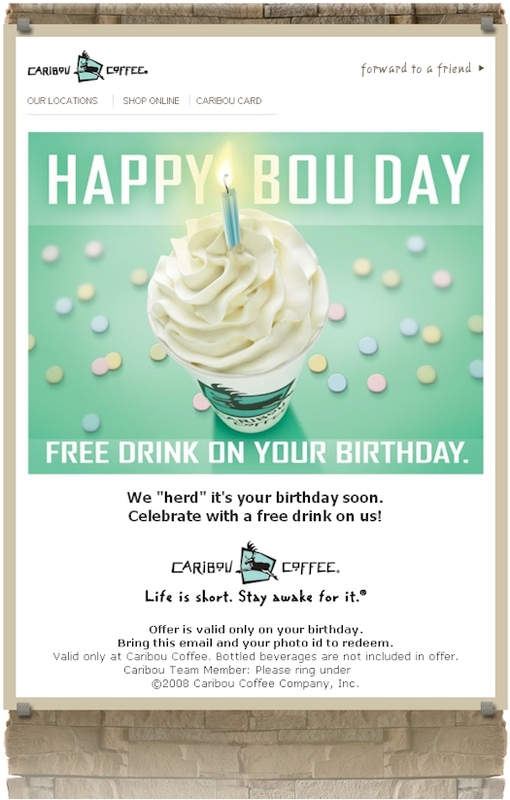 Caribou Coffee sent me the following email seven days before my birthday so I had a whole week to think about Caribou and the free drink they promised me. Notice, too, the nice job they did with branding the very phrase “Happy Birthday” with “Happy Bou Day” and with the pun: We “herd” it’s your birthday soon. Nice touch. And Facebook, of course, does it’s birthday marketing year round through the useful function of reminding you of your Facebook friends’ birthdays so you can wish them well on their day. 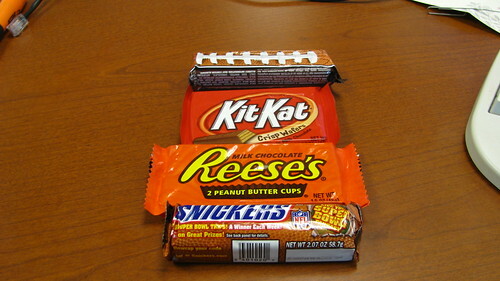 When you’re day comes, you anticipate your friends returning the favor. Now, with the exception of Facebook friends, all of the above messages are automated and everyone knows it…but it’s still nice and it is a relatively simple marketing tactic to implement. And by comparison, the lack of a birthday greeting is glaring: Where’s the love, Twitter? Flickr? …which, by the way, is a great way for the Ting Tings to market themselves because I’m sure many people, as a friend of mine did today, send that video with their birthday wishes.